This seems to be the summer when I write about Fäviken, the famous restaurant near Åre in Sweden, even though my one meal there was a couple of years ago. 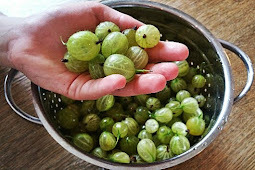 I just posted the recipe for a meadowsweet cordial that was inspired by Fäviken, and now this. Among the many memorable dishes were the fattest scallops that I have ever seen, served in its shell. The waitor informed us that they were fresh from Norway, which is less than 50km away. The next summer after we ate at Fäviken, there were fresh scallops in their shells at the fishmonger. They were expensive, but we had to try to recreate this dish, or to be more precise, Peter had to recreate the dish, grilling and seafood being part of his manly terrain. 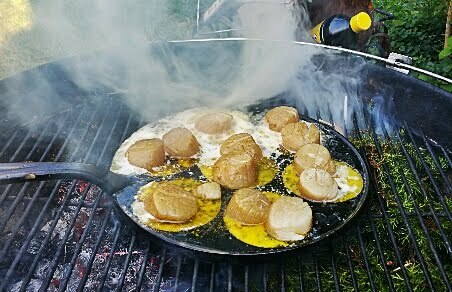 It has become an annual ritual of summer for us to eat these scallops, whenever we can get scallops on the shell at the market, which is not that often. I had thought about putting it on my blog, but cleaning the scallops is time consuming and a bit much for your average cook, and, in fact, I have never done it, only watched Peter. This year, Gustaf requested these scallops for his birthday dinner. 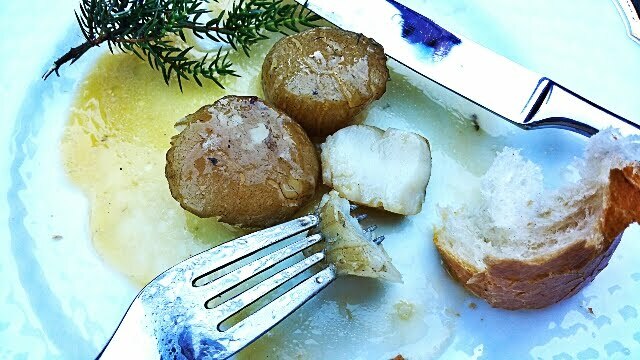 We were unable to get the scallops on the shell, so we decided to try make the dish using frozen scallops. The result was splendid, cheaper, and so so easy. Now, Faiviken's version, as I recall, was delicate, with just a smidge of butter, and a whisper of smoke. Peter's version is more. More butter, more smoke. And I think it is even better than the original. The dish just requires three ingredients: scallops, butter, and juniper. Somehow, when the scallops meet the butter and both are infused with the aromatic smoke from the juniper, the results are much much greater than you would believe. 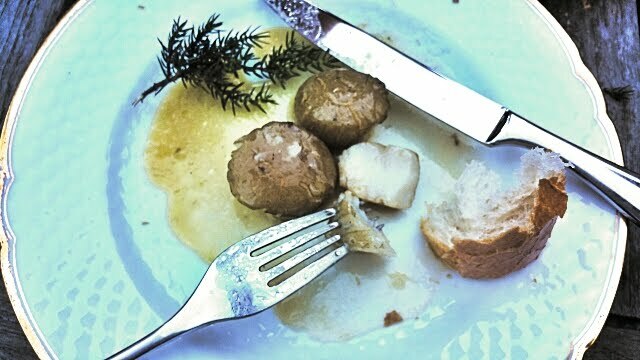 The buttery juices are delectable and must be soaked up in lots of crusty bread or a spoon, if you are greedy. This recipe is more of a method than an exact science. 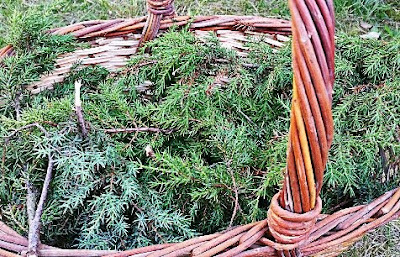 Gather an armful of juniper. This is a common plant, so you probably have a juniper tree growing near you somewhere. You can identify them by their blueish purple berries which can be picked and used to flavor wild game dishes, a commong flavoring here in Sweden. Allow 2 to 3 large scallops per person, for a starter, more if you are serving these as your main course. You can use fresh or frozen, the largest that you can find. I found mine at the local ICA store in the frozen section, about 30 scallops in one bag. If you are in the USA, Costco has excellent frozen scallops and I recomend those unless you have a really good trusted fishmonger. Light an outdoor grill with charcoal. While the coals are heating, you can prepare the scallops. Get ready copious amounts of butter. 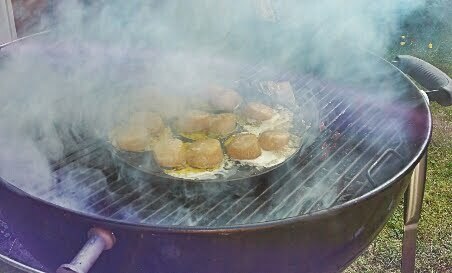 Find a cast iron pan or something that will take the heat of a grill and has some edges to capture the juice. We used a Swedish pancake pan, which has convenient depressions. On a cast iron pan, arrange large splodges of butter--more than you think necessary. Then double that amount. Lay the mussels on top of the butter. 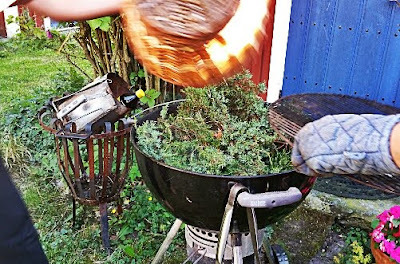 When the grill is hot, throw the juniper onto it. It will start smoking immediately. Alot of smoke. Put the rack down and then put the pan with the mussels on top. Put the lid on the grill. Let the mussels cook for a couple of minutes until the butter is melted and slightly bubbling. The mussels will taken on some color from the smoke. 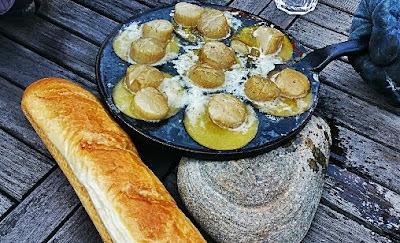 Serve immediately, spooning the juices over the scallops with lots of crusty bread to soak up the flavored buttery juices. Don't be shy about dipping your bread into any juices that might remain in the pan. Try not to fight over it.